Do you fancy a perfume that smells bright, fresh, and spicy? Such elegant and distinctive aroma is great to boost your confidence as well as embolden your presence. For such perfume, you may want to consider getting either Versace Eros or Viktor & Rolf Spicebomb. Both products are immensely popular on the market, standing in a similar price range. 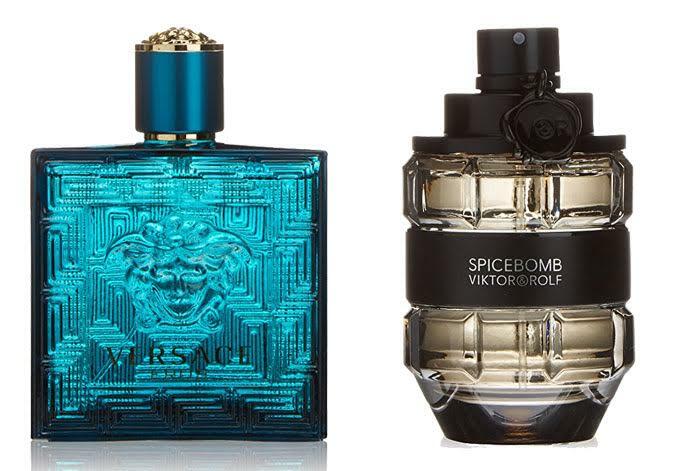 So, should you go with Versace Eros or Viktor & Rolf Spicebomb? Let’s take a good look on each in order to determine which is the best for you! Greatly inspired by and connected with the Greek mythology, Versace Eros is a perfume that aims to reveal, release, and accentuate unrestrained passion and desire. It is named after the Greek god of love, son of goddess Aphrodite, Eros. Created by Aurelien Guichard, Versace Eros combines into a perfect harmony the sweet and salty notes of sea water and the nuances of sunny warmth on your skin. The spicy and fresh part of the scent is delivered by notes of mint oil, green apple, and Italian lemon, while the warmth is provided by tonka mixed with Venezuelan ambroxan and geranium flower, giving the fragrance a fougere twist. Versace Eros is also known to have a strong sillage and long-lasting longevity, making it an excellent choice for daily wear that can last throughout the day. After the perfume house delivered a great success with Flowerbomb for women, they now come with the male equivalent, Viktor & Rolf Spicebomb. While flower notes are indeed feminine, spices are masculine, unique, and distinctive. Spicebomb is an explosive and extrovert oriental fragrance, featuring a woody and spicy composition. Perfumer Olivier Polge has blended two opposing fragrant accords into the product: the addictive and fiery tones, and the explosive and icy notes. The fiery accord features notes of chili, leather, saffron, tobacco, and vetiver, whereas the explosive accord includes bergamot, grapefruit, pink pepper, and elemi. Viktor & Rolf Spicebomb also has heavy and long-lasting sillage. Both perfumes are great choices for daily wear. They both can last throughout the day. If you prefer to have more fresh notes, you should go with Versace Eros. On the other hand, Viktor & Rolf Spicebomb is great if you prefer a spicier fragrance.